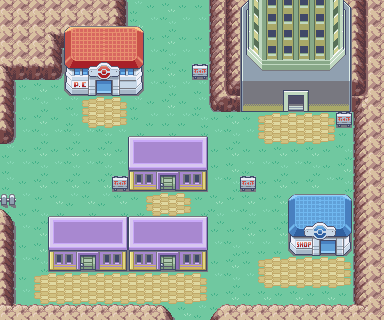 Lavender Town is just a stop on your journey for now. The Poké Mart here is the first to sell Great Balls and Revives, so pick some up if you want any. Heal up from your trek through Rock Tunnel and head west to Route 8 when you're ready for the next city. Ever wanted to go back and change one of your Pokémon's nicknames? Well, here's the only place where you can do it. Enter the building adjacent to the south entrance and talk to the man inside. This self appointed "Name Rater" will let you change the name of any Pokémon you captured. Pokémon acquired in trades cannot be renamed. You can't complete Pokémon Tower until you've dealt with Team Rocket in Celadon City, so feel free to skip this for now. If you enter you'll find some psychic trainers under some kind of mysterious spell. There's a healing zone in the middle of the tower, so this is a great place to level up if you've got Pokémon who need XP. Even if you clear the tower right now you won't be able to access the last floor, as there's an unknown ghost blocking it. You'll need the Silph Scope, found in Celadon City, to get past it. There isn't much you can do in here on your first to lavender town. You'll be told that Mr. Fuji is missing, but that's about it. Once you've completed the Pokémon Tower this is where Mr. Fuji will give you the Poké Flute. Poké Flute: given to you by Mr. Fuji after clearing Pokémon Tower. This page was last edited on 3 May 2016, at 12:31. This page has been accessed 487,370 times.